There is also free entertainment at the Bandshell & Millennium stage. Visit the Restored Farm House, the Historic Restored One Room School House and many food stands, merchandise stands, games, rides and more. Bring the family for a day of fun! Bus will Depart Bloomsburg at 5:00pm from the same location that you were dropped off. - Please check with your tour director for more information regarding this location before disembarking for the day. 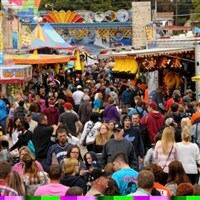 Tickets to the fair must be purchased online at www.bloomsburgfair.com or at the gate. Ticket cost is $8.00 per adult. Children under the age of 12 are admitted free.